Following the success of having the Tremeloes appearing at their Charity Beat Ball in 1963, the following year, 1964 the Geo. W. King Apprentice Association secured the appearance of a group that would become world-wide superstars, The Rolling Stones. At the time they had just had their first hit record, “Not Fade Away” which had reached number 3 in the UK Singles Charts two months earlier. 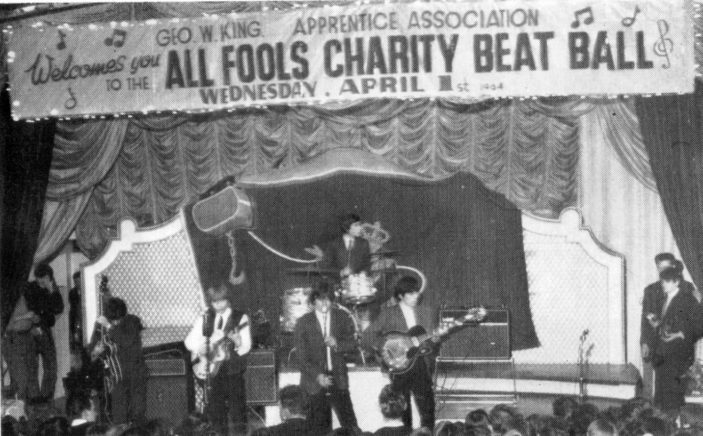 Not only had the Apprentices had the “Stones” perform at their Ball but in January of that year they had also been to London to see the Beatles’ Christmas Show, seen the Searchers at Bedford and on May 2nd were due to see the Dave Clark Five at the Finsbury Park Astoria, four of the top groups of the time. The following is an account of the Ball from the King News Letter Spring 1964. The above Beat Ball starring The Rolling Stones, Big Dee Irwin, The Diamonds, The League of Gentlemen, Terry Judge and The Barristers and a local Mystery Group called The Deltics, took place at the Locarno Ballroom, Stevenage, on 1st April 1964. The evening proved to be a great success and was attended by a capacity house of 2,500, mostly the younger generation who screamed their delight at their Pop Idols. During the evening Mr Hartford King presented a cheque for approximately £58 to Mr Dickinson Wright M.S., F.R.C.S. for the Imperial Cancer Research Fund and a cheque for £58 to Mr H. A. T. George for the Stevenage and District Mentally Handicapped Children. He also gave a speech of thanks to all who had supported the function. Hi, I was the bass player in the Deltics when they supported the Rolling Stones at the Locarno in Stevenage, I was a founder member with Alan greed and Dave Jenkins, I later went on to tour the States with Uriah Heep as part of the “crew”. Great times! At the time of the Stones we had a rhythm guitarist called Brian something or other. We were dressed in our very smart Royal blue jackets and silver grey slacks. As the stage started to revolve when we had finished our set (the Stones were on the other side) Brian said ” they must have liked us mate hark at the crowd”, and he was serious! The guy that ran off with the gear was actually “Alf Lambert” not Harry. He used to own a florists in Welwyn Gdn City, and he was slippery so you got that right mate! I was not there but I was a guitarist member of the local mystery group, The Deltics! Unfortunately I joined shortly after this event and being a BAC apprentice (1963 to 1968) who never had any money in those days to get into such events, meant I couldn’t afford to be there! Some members of the Deltics at that time were, guitarist Dave Jenkins and singer Alan Greed and a tall guy on bass called Rick who I also played with but for the life of me can’t remember his surname!! He also played with another local band called the Gypsies! I have a pretty good memory but cannot even hint at our drummer’s name at the time! We were quite a popular band playing gigs in and around Stevenage, Luton, Hemel and venturing into London! The demise of our band came when our manager, lets call him Slippery Harry Lambert ran off with all our gear one night never to be seen again!! About a year later, Dave and myself, Steve Miller started another band we called “Revolution” which then toured Germany as the “Freightliner Blues Band” with Alan Greed, our mate who we had poached from another local band who’s guitarist/keyboard player was Ken Hensley, founder member of Uriah Heep! Dave Wingate guitar and Chris Gourdine from Hitchin on drums. Our band eventually became “Harsh Reality” and we made an album after winning a recording contract with Phillips which was called, “Heaven and Hell”! This album became a collectors item at auctions and you had to pay more than four hundred pounds to get one! Someone who bought one was Paul Weller of the Jam and he covered one of the songs live on TV and his biographer who worked for an online label, Cherry Red Records set about re-releasing the album on CD and Vinyl! I was there! I bought a poster. I remember they sang Little Red Rooster. I missed the last bus home and had to walk to Roebuck very late.